Bong County – At least 12 members of Liberia’s Fourth Estate are said to be in critical condition at the Phebe Hospital in Gbarnga, Bong County after a jeep in the opposing lane of the Presidential convoy ran into the Executive Mansion press vehicle, carrying the journalists. Deputy Presidential Press Secretary Smith Toby confirmed to FrontPageAfrica a short while ago that the jeep, said to be carrying Cllr. Micah Wilkins Wright and a lady identified ad Victoria Wlue, ran through the presidential convoy and hit the Executive Mansion press vehicle. 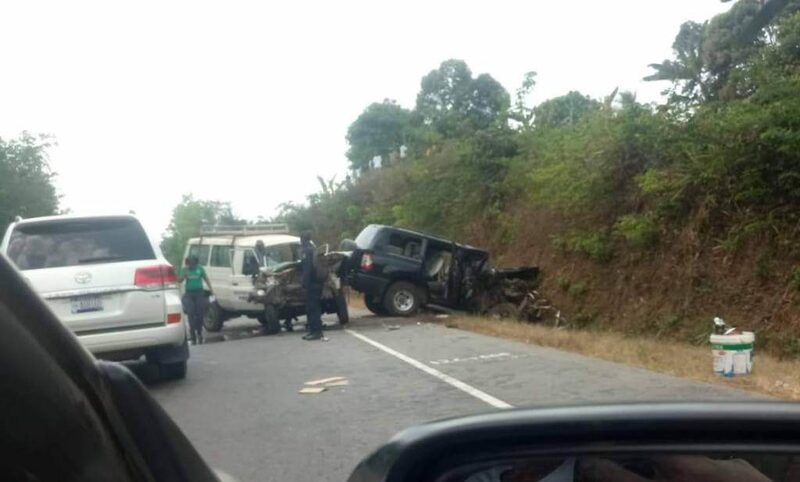 The accident took place on the Bong County highway between Gbarnga and Totota, near the Charles Taylor Market. The Deputy Press Secretary said some of the injured are in the process of being transferred to the John F. Kennedy Medical Center in Monrovia for treatment. The President and crew were on their way to attend the 180th Methodist Annual Conference in Gbarnga, Bong County.